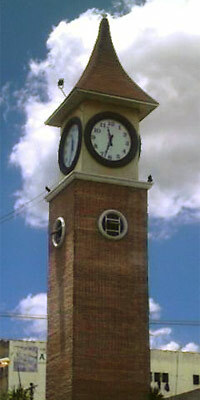 In the town plaza of the poblacion of Baliuag, Bulacan stands the Clock Tower, reputedly the only self-supporting clock tower in Bulacan. The clock tower is one of the popular Heritage tourist attractions in this town, and one of the most pictured landmarks in Baliuag. A stone’s throw to the north is the equally-picturesque baroque Church of San Agustin, and to the west is the circular Glorietta Park, established in 1905. The tower stands three stories tall and it’s supposedly the clock the church adheres to. When the clock strikes 6 in the evening, the church bells start ringing for the Angelus. Apart from that, I have found very little information on the web regarding the Clock Tower, like when it was erected and whether it replaced some other tower before. I suppose a trip to the municipal hall will provide some answers. I find it interesting that the clock tower rises from the middle of the road. Do you think there has ever been any vehicular accident involving the tower? If you’re interested, you might want to download this pretty artistic 1024×768 wallpaper of the Baliuag Clock Tower from the official Bulacan website. sounds interesting seeing those heritage site particularly that clock tower situated not at the center road but downright corner of the plaza. Plus the fact that during those times it seems to me that road is not as busy as today it is, perhaps traffic is not in the vocabulary yet.